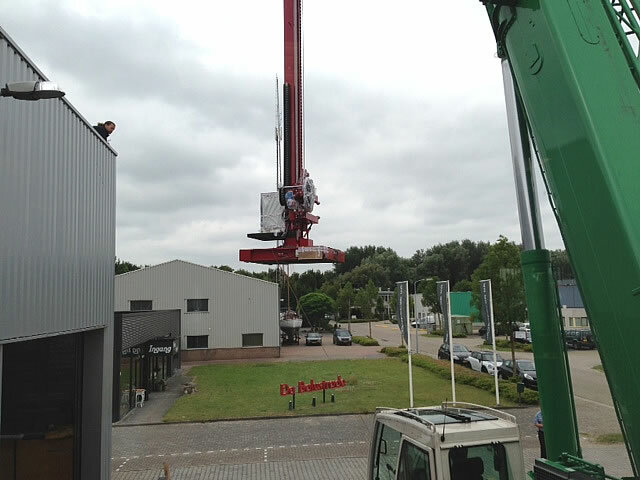 Red-D-Arc designed and built a custom made manipulator with a boom length of 30 ft for a leading tank manufacturing company in the Netherlands. 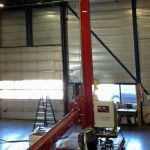 The Red-D-Arc facility had to be customized with a raised roof section to accommodate the height of the large column. 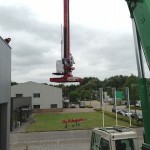 The raised roof was later opened, allowing for a crane to hoist the manipulator out of the manufacturing facility and then shipped to the customer. 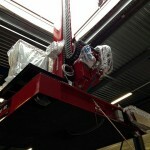 The manipulator was part of a welding system provided by Red-D-Arc. 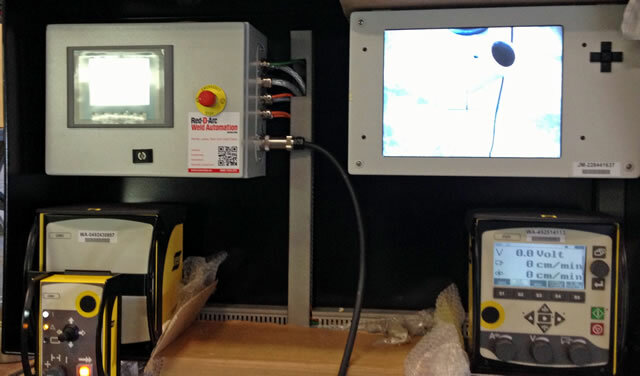 The system featured a compact welding head designed for welding in narrow spaces, touch screen controls and a high resolution weld monitoring system to allow the operator to monitor the welding process from a safe distance. 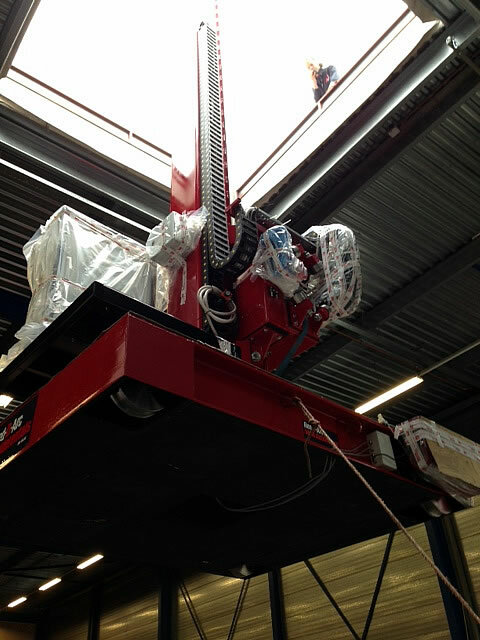 Earlier this year, Red-D-Arc delivered several of our MIG/MAG 4-pak and 6-pak multi-operator welding packages to Heerema Fabrication (HFG) for their yards in Zwijndrecht and Flushing, Holland. HFG manufactures complex steel structures for use in the offshore oil and gas industry. 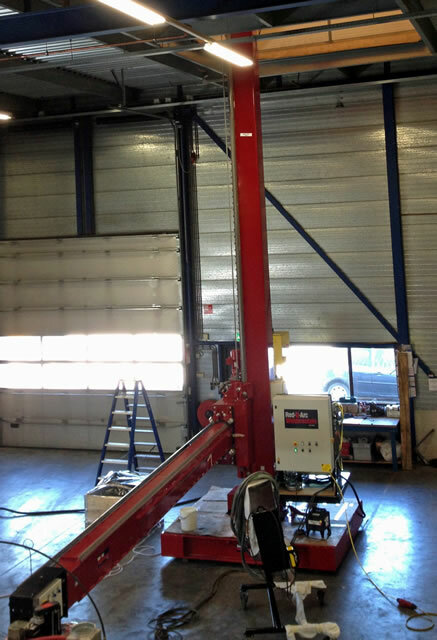 In addition to maintaining high-quality welding standards, HFG was able to increase both worker productivity and safety by employing Red-D-Arc’s multi-operator packs for the welding processes at their fabrication yards. The packs include six welding power sources and wire feeders with gas lines to accommodate up to six individual welders – and each welder has his own 115VAC power supply as well as an airline that provides filtered breathing air to the welder’s helmet. 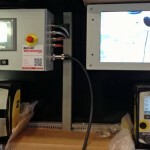 All input power, shielding-gas and breathing-air connections are made via single connections in the pak’s enclosure in order to simplify hook up as well as enhance portability. After receiving their initial order of 6-paks, HFG placed a second order for 4-paks, having recognized the benefits of the system. 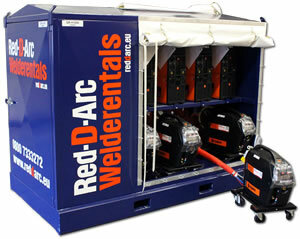 Red-D-Arc 4-Pak and 6-Pak MIG/MAG Multi-Operator Welding Packages are available for rent, lease or purchase. Contact Sales to learn more. In order to better serve our clients who conduct business outside of North America we have recently expanded the range of our global service offering with the acquisition of A&N Plant in the United Kingdom and A&N Europe in the Netherlands. These companies are currently engaged in equipment manufacturing as well as sales and rental services of welding-equipment products on a worldwide basis – through both company-owned depots and an extensive dealer network. In conjunction with this acquisition we are pleased to announce the appointment of Andre Frenette to the position as vice president of European Operations for Red-D-Arc. A&N principals will continue to function in their present management capacities within the new structure. In the UK click on www.anplant.com and in the Netherlands click on www.aneurope.nl to learn more about A&N’s global product and service offerings. What Do American Welding Society Wire Filler Metal Designations Mean? Is Gas Welding Really Cheaper? Lions, Sharks and ... Dry Ice Blasting? 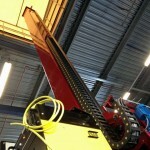 Rent, Lease or Own Welding Equipment? 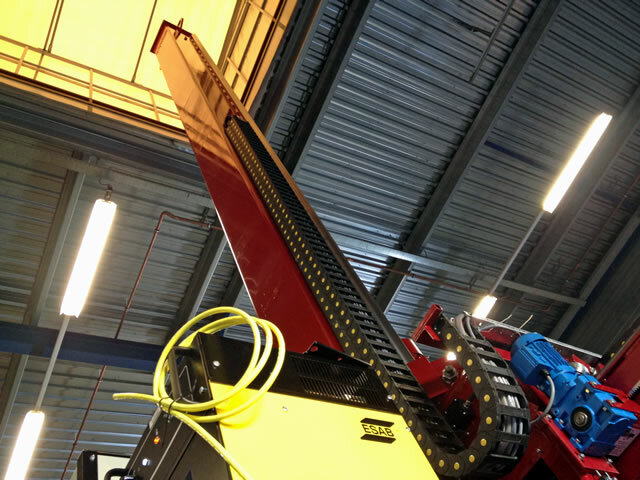 Red-D-Arc UK Supplies QA Weldtech UK with a Fully-Automated Welding System for the cladding of 6.5 meter pipe, with inconnel 625. Copyright © Red-D-Arc Inc. All rights reserved. Copyright © 2019 Red-D-Arc Inc. All rights reserved. Airgas, an Air Liquide company, is the nation's leading single-source supplier of gases, welding and safety products. Known locally nationwide, our distribution network serves more than one million customers of all sizes with a broad offering of top-quality products and unmatched expertise.